Returning from a long road trip to Santa Teresa Friday, the Lady Bulldog basketball team had no time to shake off the effects Saturday at Bulldog Pit. As such, the Artesia girls never built quite as large a lead over the Lady Chargers of Albuquerque Academy as it was evident they could have. But despite a few missed opportunities here and there, the Lady ‘Dogs still closed out their 5A weekend with a lopsided win, 48-28, and that combined with their 65-20 drubbing of Santa Teresa Friday ultimately produced the desired result. “These were two good games for us,” head coach Jeff Houghtaling said Saturday. “We were real excited to get these two twins. That makes three in a row against good 5A teams we needed to beat, teams that are a little down this year, maybe not as good as they’ve been the past couple years, but are still 5A opponents I think will be competitive in their districts. The girls in orange got off to a bit of a slow start Saturday afternoon against Academy, as both teams struggled with turnovers. Artesia kept the Chargers from any offensive looks through the first three minutes of play but were missing the net on their end, as well, until – with 5:10 to go in the quarter – Gracie Puentes finally delivered from under the basket on a turnover. 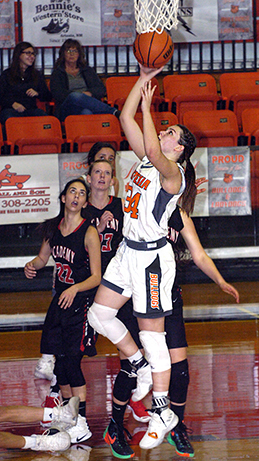 She’d repeat the feat to make it 4-0, then follow a free throw each from Elisa Cardenas and Paityn Houghtaling with a third and final field goal to send Artesia into the second up just 8-2. The shooting didn’t improve on either side in the next period, with just seven combined buckets logged. But the Lady ‘Dogs made theirs count, as Kyrah Gonzales and Cardenas both delivered three’s, which – added to baskets in the paint by Houghtaling and Kinli Taylor – gave Artesia a 10-point edge at intermission, 18-8. The Lady Bulldogs began to settle in a bit more offensively in the third. After two straight baskets by Academy’s Kelsey Crist made it 18-12, Puentes would put one in on the assist from Stacia Martinez, and Alexa Riggs would follow with a trey to bump the Lady ‘Dogs’ lead to double digits. Taylor added a bucket and a pair from the free-throw line, and Martinez would contribute a layup and an old-fashioned three-point play to send Artesia into the fourth on top 32-16. 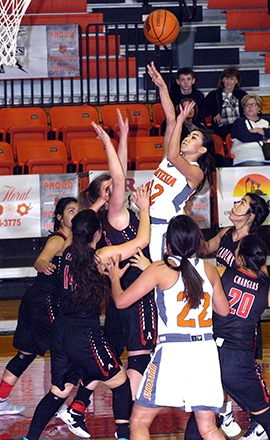 Houghtaling posted a basket inside to kick off the fourth, Gonzales followed with a three, and an offensive putback by Martinez took Artesia closer to the 20-point mark, 39-20. They wouldn’t hit it until the final moments on a second consecutive basket by Elliot Harrison, but they’d hold it through the horn, 48-28. “I don’t think we shot particularly well today,” Coach Houghtaling said. “We shot OK, but it was really the high-percentage shots we got in transition that were the difference, and we owe that to our defense. Puentes and Taylor led the Lady ‘Dogs in scoring with eight each, followed by Martinez with seven, and Crist finished with 12 for Academy. Artesia shot 44 percent from the field on the contest and were 50 percent from the stripe. Similar to Friday, when 12 different Lady Bulldogs added their name to the scorebook, Artesia saw contribution from 10 athletes Saturday. “We’ve been able to get some of those kids who are kind of go-betweens between the JV and varsity into these last two or three games, and they’ve really picked up some valuable minutes,” Houghtaling said. “They’ve even given us some baskets and defensive stops, so that makes the future look bright. The Lady Bulldogs (9-7) will now prepare to join the Bulldogs in hosting Carlsbad Tuesday at Bulldog Pit, with the girls’ varsity set to tip off at 5:30 p.m. and the boys at 7 p.m.
Houghtaling also reminds the public that a few tickets are still available for the AHS Basketball Boosters’ annual vehicle raffle for a 2017 Ford Escape S. Five other winners will receive $100 each. Tickets are $20 and may be purchased from any booster member or at home games. The drawing will be held Feb. 16 on Pack the Pit Night. As they did in their last outing Tuesday in Chaparral, the Lady Bulldogs got off the bus Friday in Santa Teresa with hot hands, taking total control in the first half before coasting through a mercy-rule-clock-shortened second to a 65-20 win. Artesia was equally adept beyond the arc and in the paint on the contest, and defensively, the Lady ‘Dogs limited the Lady Desert Warriors to six total field goals on the night. Gracie Puentes got the ball rolling with a scoring barrage under the basket, following a pair of free throws with a trio of shots off the glass to put Artesia on top 8-1. Consecutive buckets by Brehnan Davis, Paityn Houghtaling and Kali Crandall made that 14-1 with two minutes to go in the period. A Brianna Barrera three marked Santa Teresa’s first field goal of the game, but the Lady Bulldogs would close out with a pair from the stripe by Kinli Taylor and a Kyrah Gonzales longball to bump their lead to 19-4 going into the second. There, amidst a rash of 11 turnovers, the Lady Bulldogs would hold Santa T. scoreless until the final 46 seconds of the half, when Rosalina Weinrich was fouled and converted both freebies. Artesia, meanwhile, tacked 16 more to their total — six from Houghtaling, five by Puentes, three from Alesa Anguiano, and two by Davis — to lead 35-6 at the break. Following a Puentes bucket in the paint and a Stacia Martinez free throw to start the third, a trey by Alexa Riggs put the 35-point mercy rule in effect, 41-6. Santa Teresa’s Lily Loya briefly stopped it with a jumper a few moments later, but following another three by Riggs, it would remain ticking through the conclusion of the contest. Davis and Martinez would also add three-pointers for the Lady ‘Dogs in the third to put Artesia up 53-12 heading into the final eight minutes. Riggs drained her third trifecta of the night early, and Elisa Cardenas, Rylee Wortley and Elliot Harrison would all get in the book prior to game’s end. A total of 12 athletes contributed at least two points to Artesia’s victory on the night, a statistic with which head coach Jeff Houghtaling was particularly pleased. Puentes led all scorers on the night with 15, followed by Davis, Houghtaling and Riggs with nine each. Weinrich finished with 11 for the Desert Warriors. “Our seniors are doing a fantastic job of leading us right now,” Coach Houghtaling said. “We’re getting the bulk of our scoring from our seniors, and I think that’s a tribute to their experience and the fact most of them have been playing three or four years now.